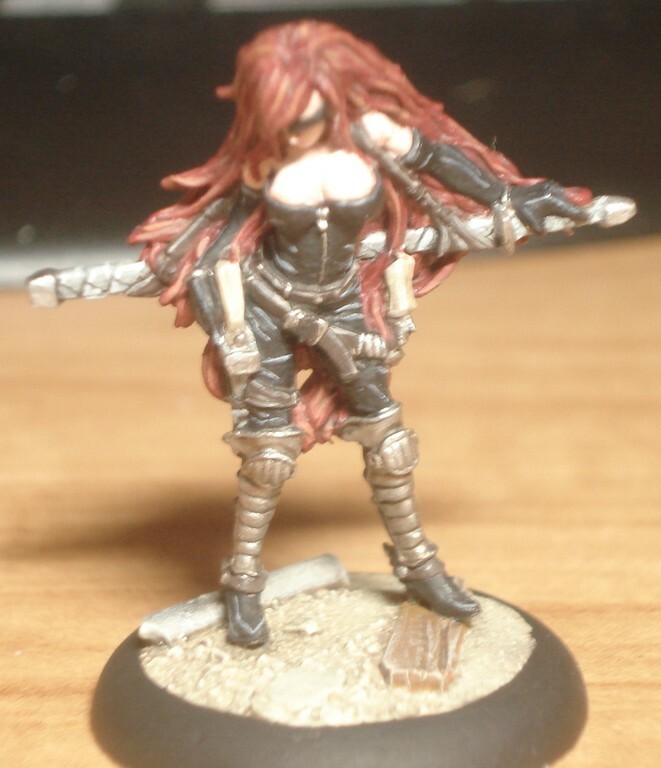 I received my gift from the Secret Santa exchange on the Malifaux forums. 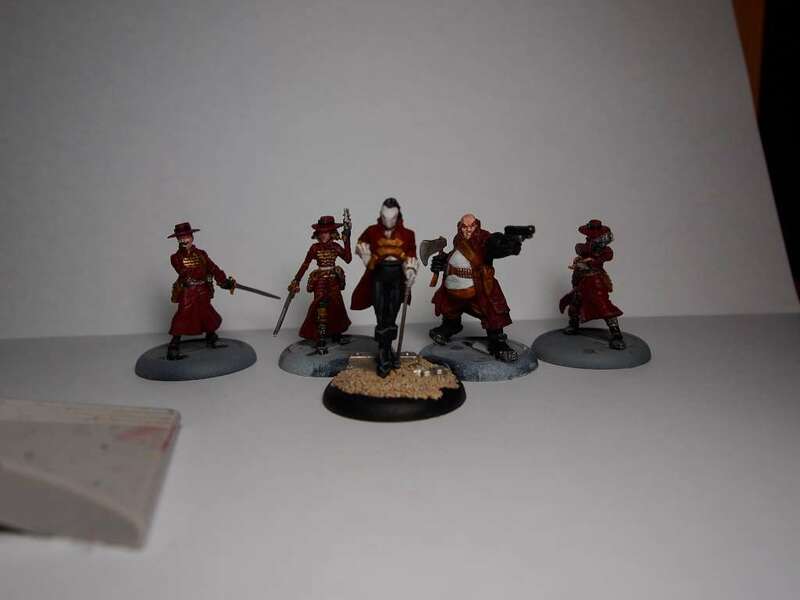 My gifter was kind enough to send a Guild Executioner and Watcher along with Sonnia Criid and friends modeled in LEGO. 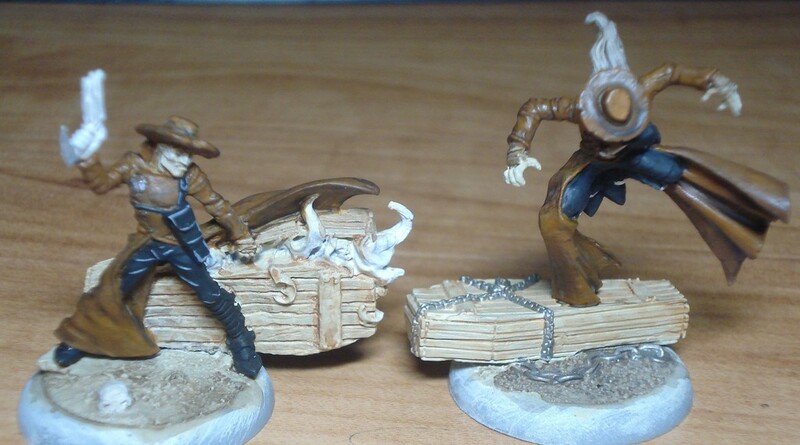 The Witchlings were even painted to match mine as you can see below. 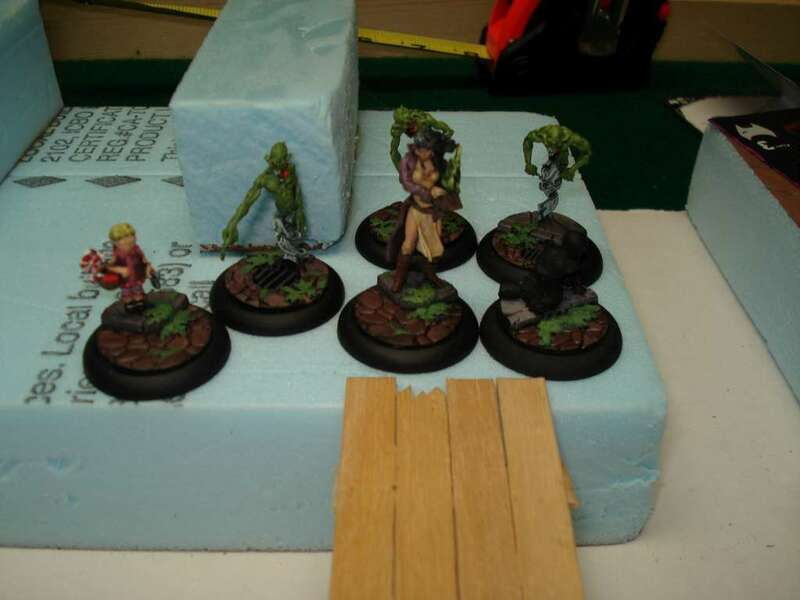 On Wednesday, Ryan and I played a game of Malifaux for the first time in ages. 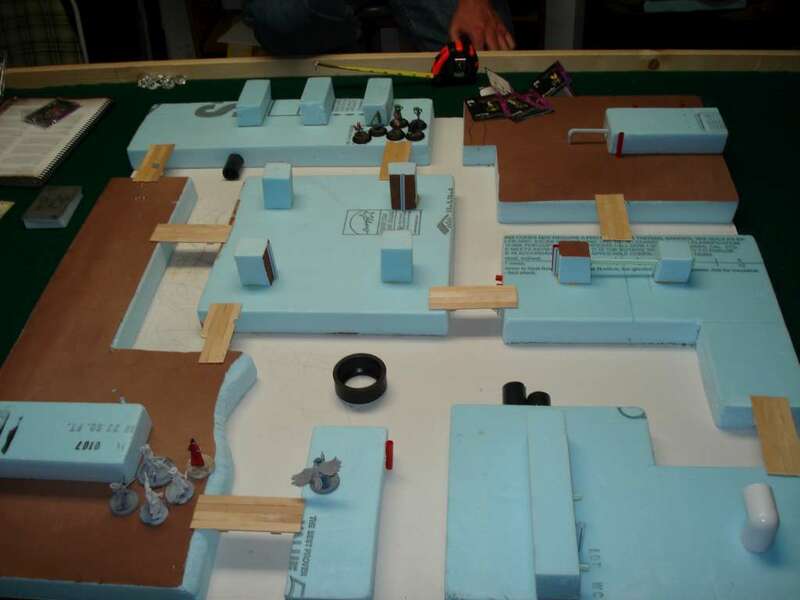 We were a bit rusty on the rules, so we were only able to get through four turns in the course of two and a half hours. I was playing my Guild with Lucius, two Guild Guard, a Guard Captain, an Austringer and Ryle. Ryan was using Pandora, Candy, Baby Kade and three Sorrows. 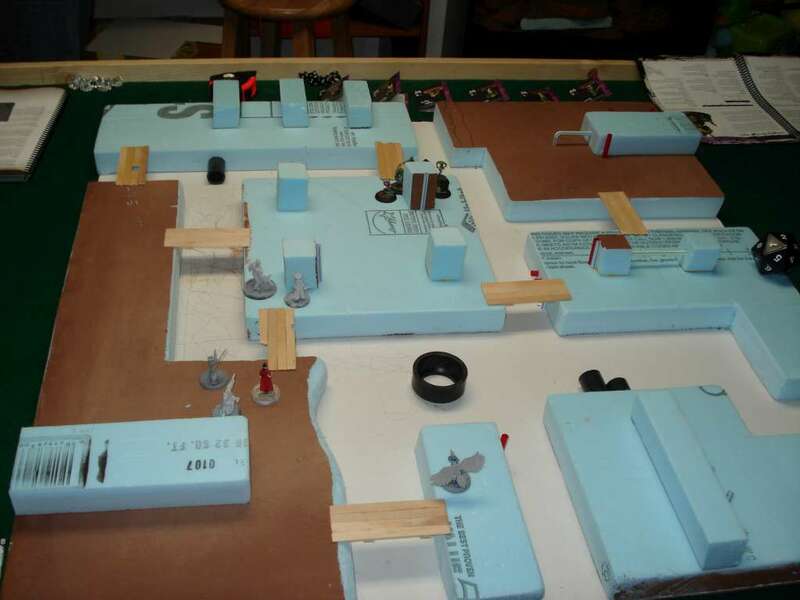 We played on the sewer board that I have been working on. 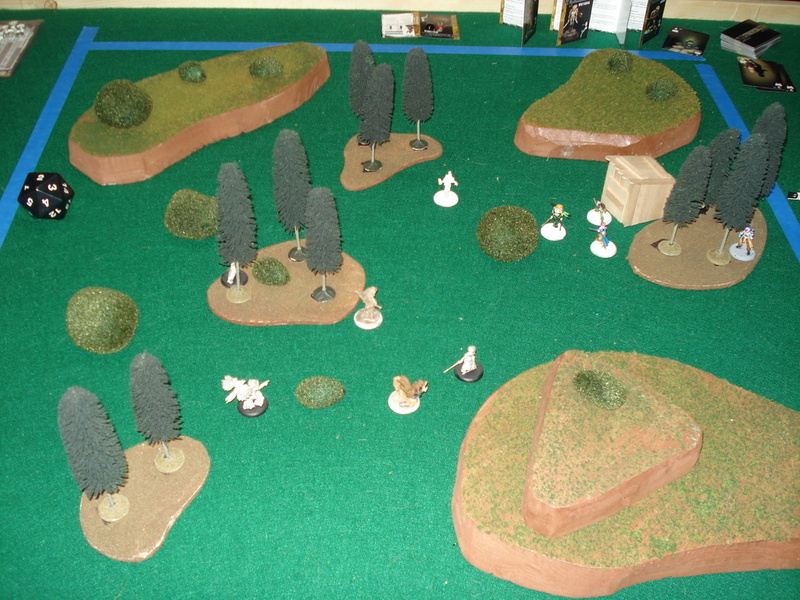 The mission was to kill the opposing Master and I took the scheme to have more models on the table at the end, while Ryan took the one to have more Soulstones (he started with seven and I, one). The game started pretty slowly with us just moving up towards the center. 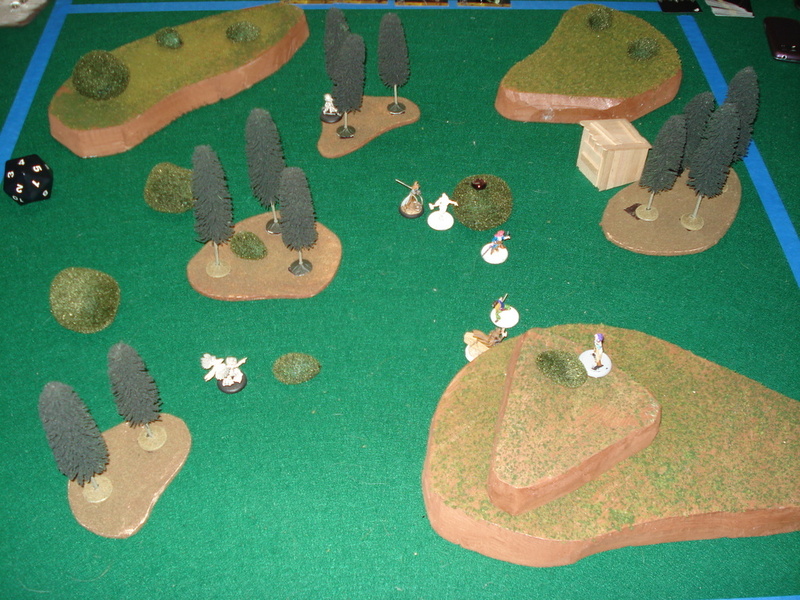 On the second turn, a Sorrow managed to Paralyze Ryle, keeping him from doing anything. 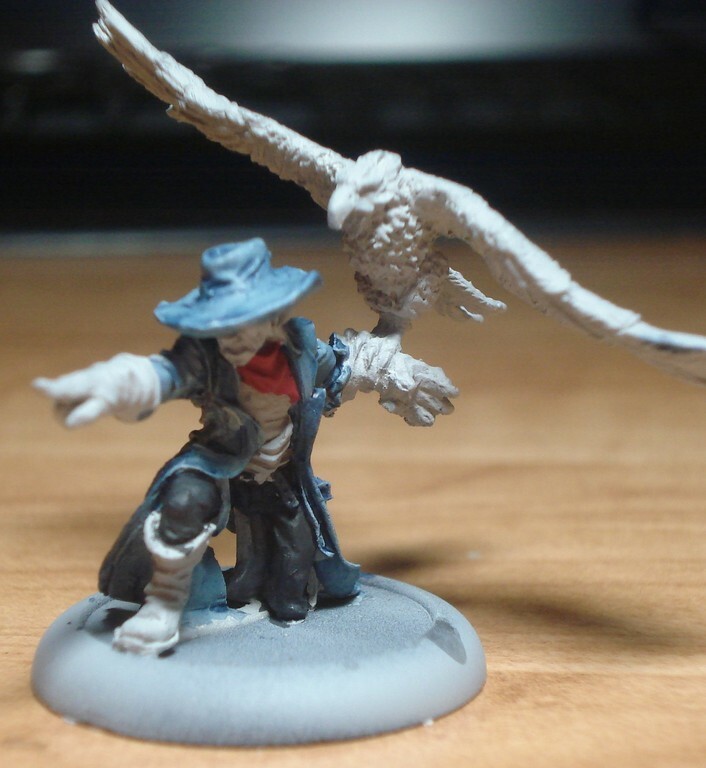 The Austringer got his first kill, when Ryan made the mistake of moving a Sorrow into range of his raptor. Kade and a Sorrow ganged up on a Guild Guard to take him out, but not before the Guard could seriously wound the Sorrow. Ryle tried to get some shots off, but didn’t do much. I forgot to take any pictures after that. Ryle beat himself up because of some influence by the Sorrow and Pandora. Lucius guided things, but I was having a tough time doing much damage. At one point, I was able to hit Pandora with a Raptor Strike and flipped a Red Joker, dealing 7 damage. On the next turn, Ryan healed Pandora with Candy and flipped a Red Joker to heal all the damage. We decided to call it on turn four. Ryan tried to make on last hit on a Guild Guard with Pandora, but failed. In doing so, he moved Pandora away from her guards, and the Austringer was able to some good hits and finished her off. It was a fun game, and it was nice to be playing again. I really liked the way Lucius works as a master, though he’s not the best against the Neverborn. 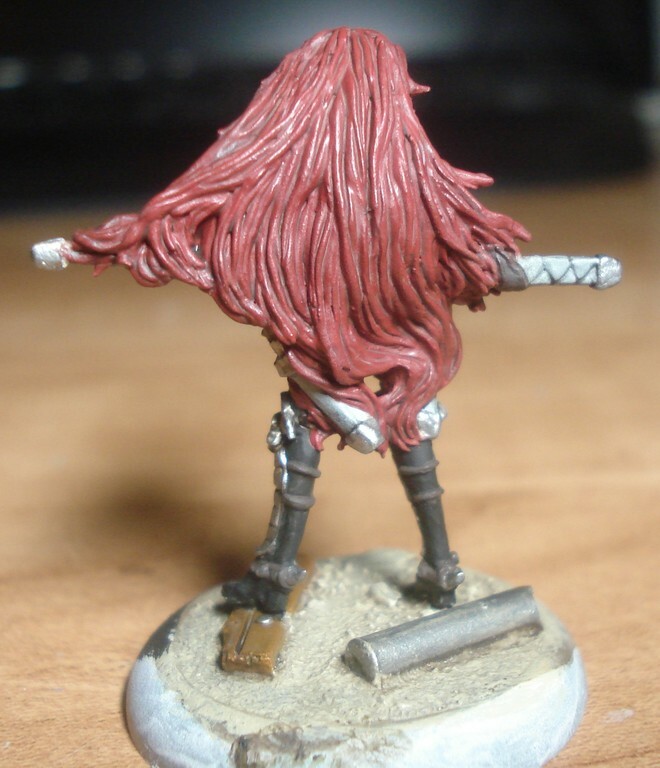 Playing again made me really want to paint more Malifaux stuff, so hopefully you’ll see more of them here soon. 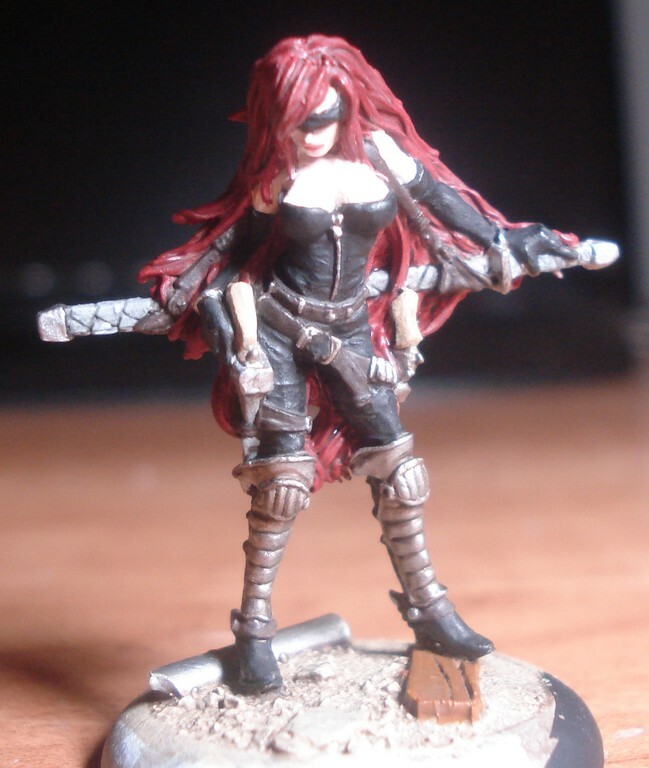 I was able to do a bit of painting last night, and I figured I’d best get working on actually finishing my Guild crew. First up are the two remaining Death Marshals. 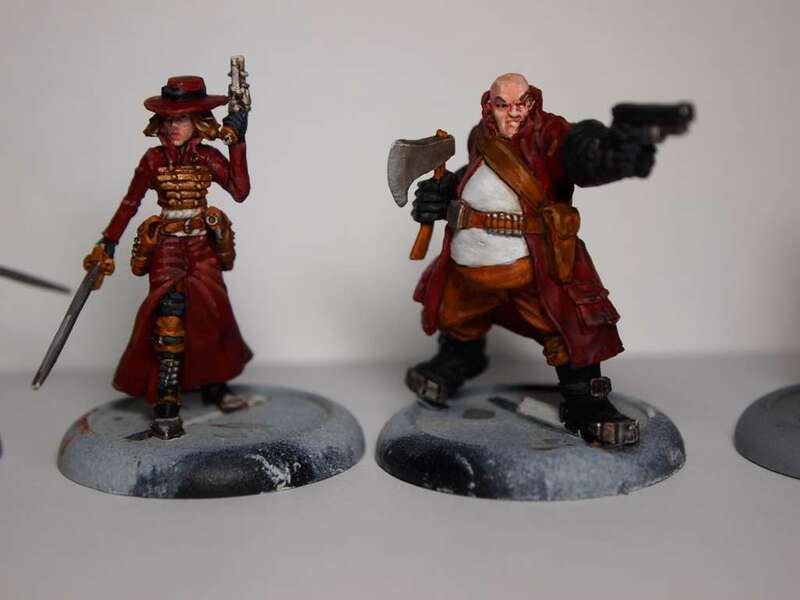 I mostly worked on their coats with some Snakebite Leather followed by a Devlan Mud wash. The next step will be to build up the highlights and then finish up the details. Next was a Guild Austringer. I did his coat with Astronomicon Grey, followed by a blue wash. I finally got around to trying out my new Windsor & Newton Series 7 brush yesterday and tonight. There were a few stray hairs that needed to be trimmed, and the brush did take a bit of work to get accustomed to, but once I got it figured out, it works great. One thing I noticed is that it does tend to split into a swallow tail shape on occasion if I’m not careful, but as long as I keep it wet and am careful, it holds a super fine point. 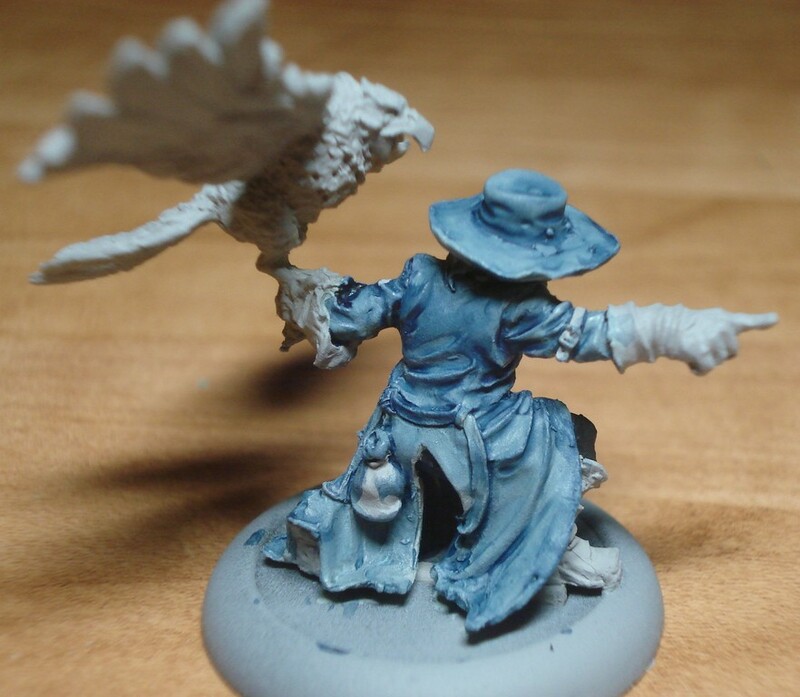 The model I took it to was the Lady Justice that had been sitting unpainted for quite a while. The hair on here is crazy to deal with. There’s just so much of it, and lots of fine details to deal with. 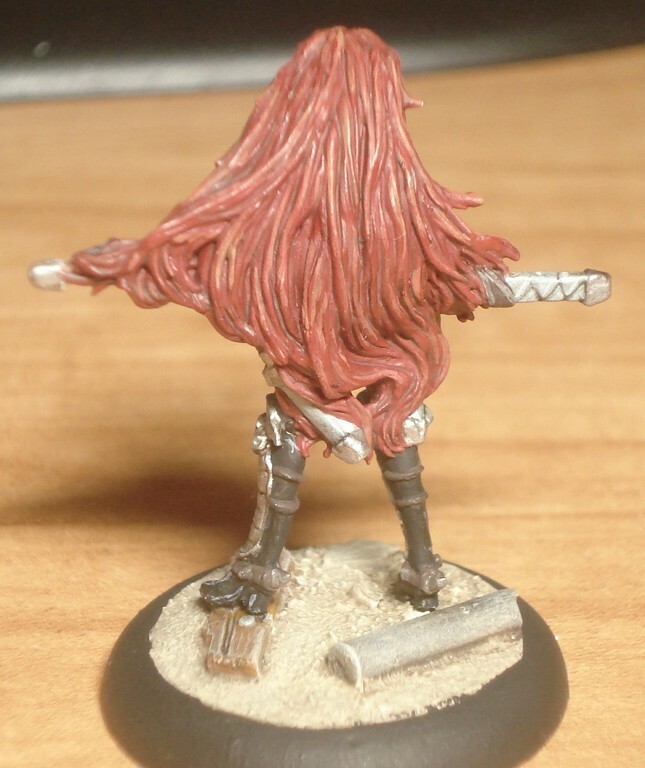 I decided not to just drybrush the hair, and actually highlighted individual pieces building it up from red to a light orange. I think she turned out quite well. Now for some WIP pics and the final pics. Sadly my light and camera washed out some of the finer details, but most of it is visible. 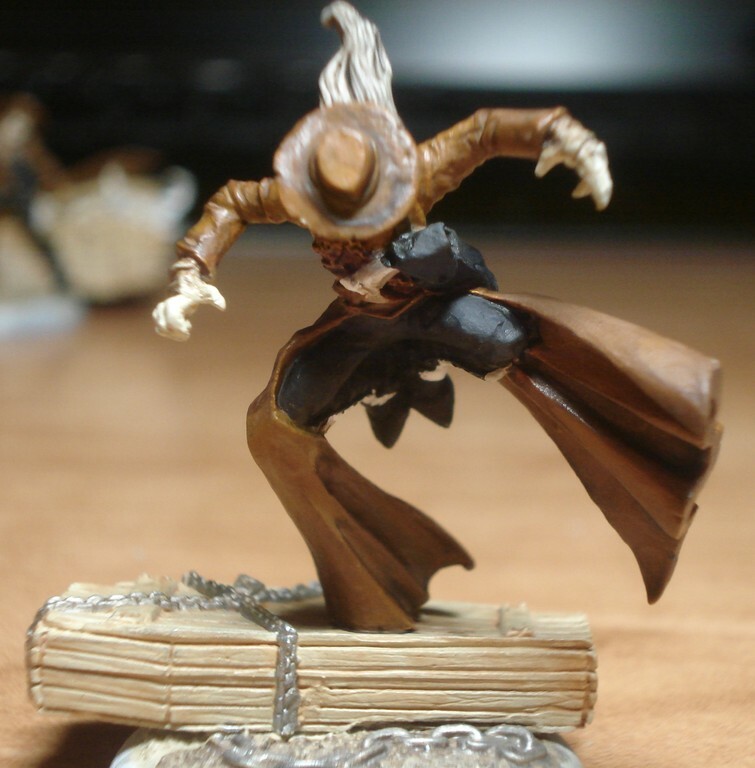 First up is a Witchling Stalker from Malifaux. I had finished him a while ago, but I only recently finished up the bases for them and he is the first to get the full base treatment. The fence in the background is from a Warhammer Chaos Rhino. 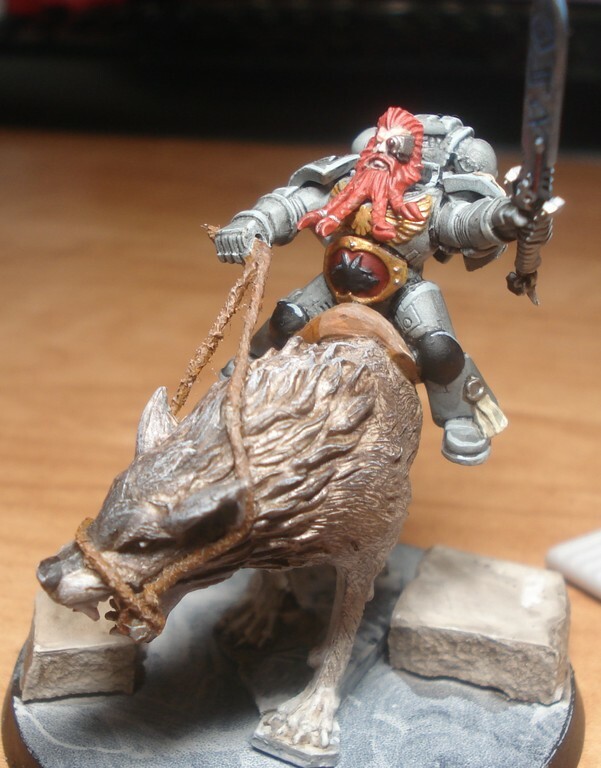 Next up is my second Wolf Lord on his Thunderwolf. I still need to finish his base, but I am waiting until I have a few more Space Wolves painted so I can get them all based at once. 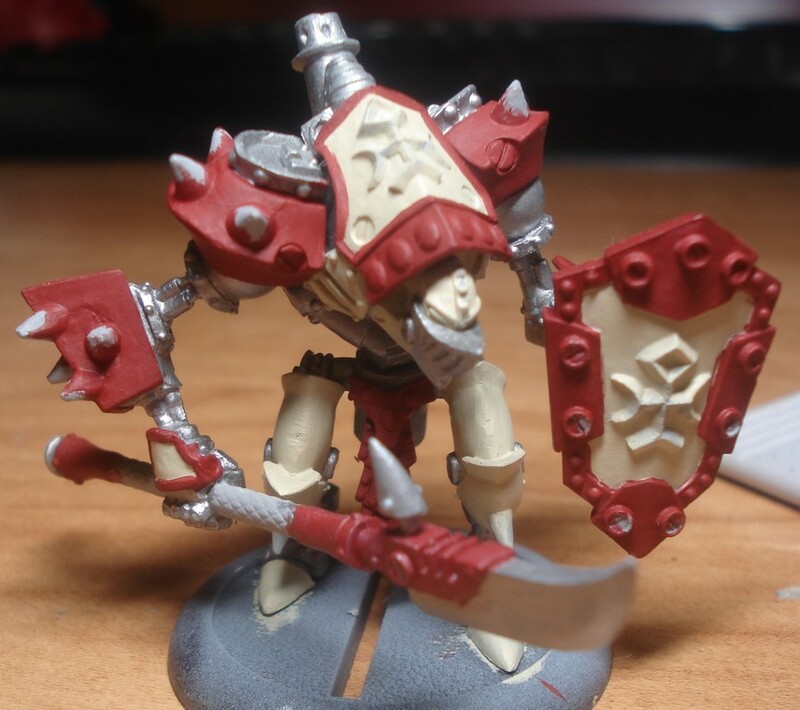 Last up is the Warmachine Menoth Warjack that I am working on. Right now I am just blocking out the base colors and trying things out. 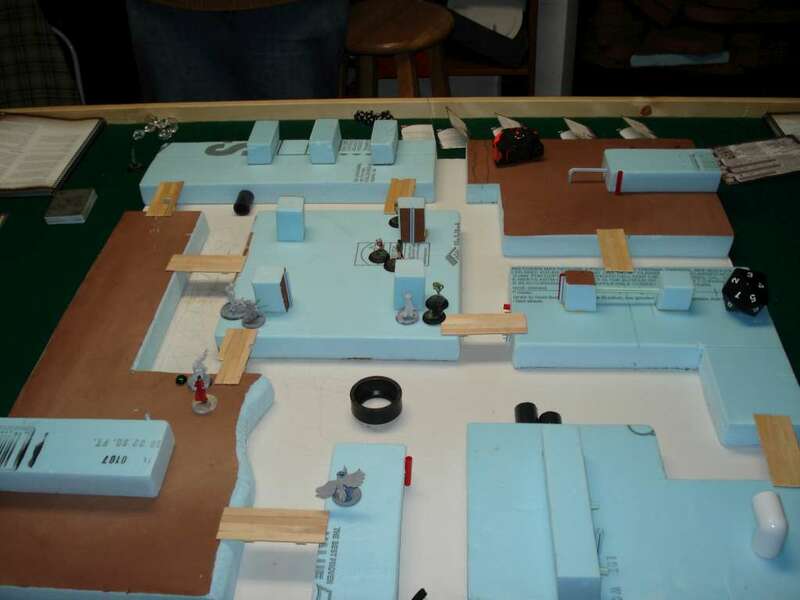 It’s a neat project, just because of the large areas to paint. Not a ton of tiny details, so I have a chance to try some different things. That said, I’m not 100% sold on the color combination, so we’ll see if it sticks around, or if things change drastically. That’s pretty much what I’ve been working on lately. 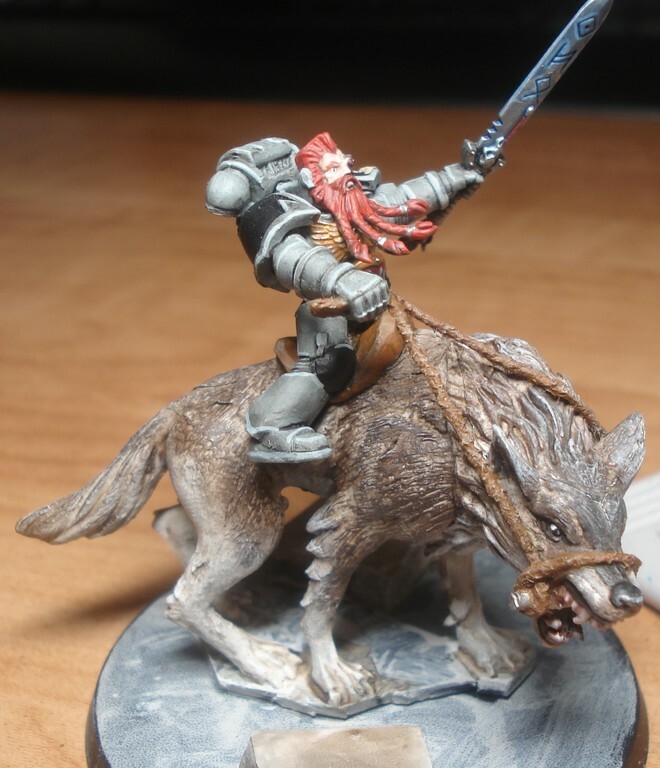 I have also been working on assembling some Mithicast Thunderwolves, and I plan on writing a review of them once I finish them all, but my initial impressions are mixed. The wolves themselves are quite detailed, but that detail seems to have played havoc with the molds and there are tons of flaws on the wolves that are a royal pain to fix. Anyways, more detail will be covered later. Thanks for visiting, and happy gaming. 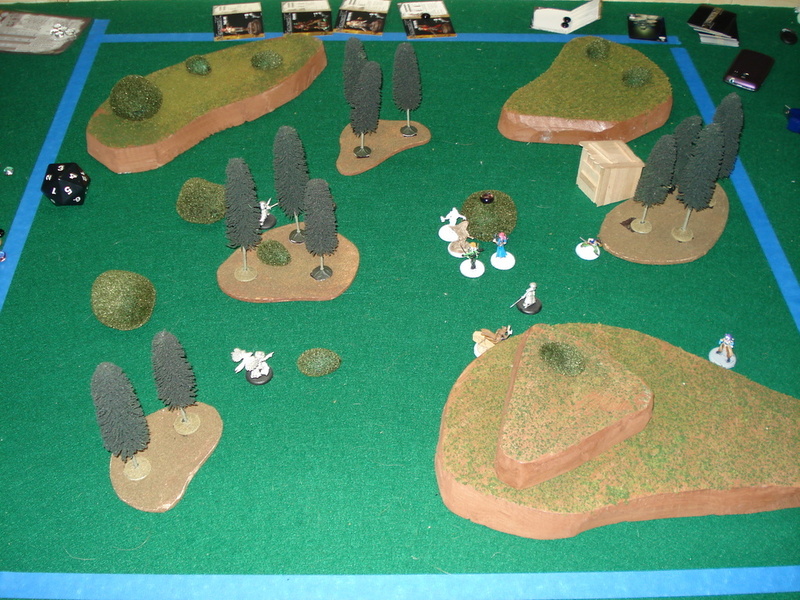 As promised earlier in the week, here is the short report of my wife and my game of Malifaux from last Friday. She was playing her Viktorias, with two Ronin, Taelor and 7 soulstones. 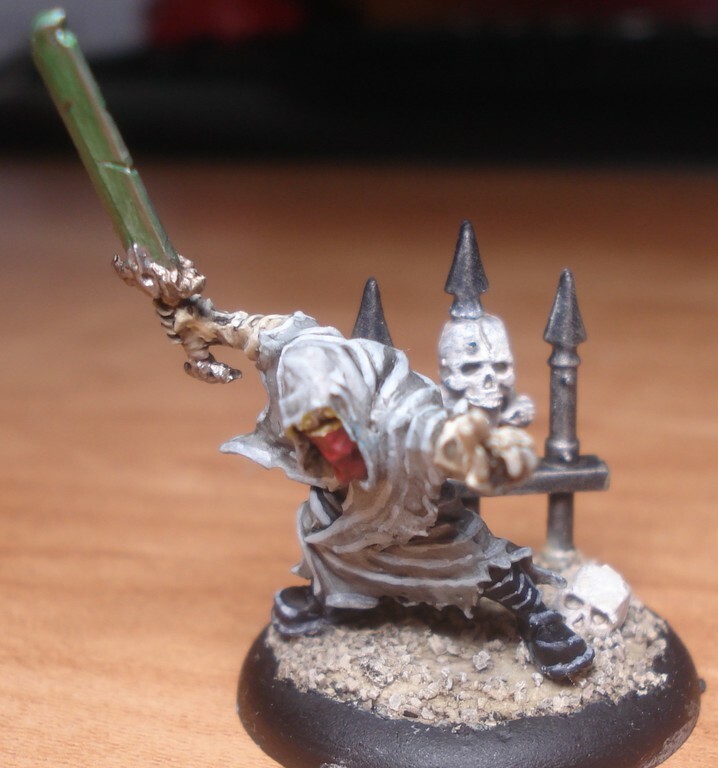 I have Lady Justice, the Judge, a Death Marshal, two Guild Guard, an Austringer and 5 stones. Since we were a bit rusty on the rules, we just played with a single shared goal of Plant Evidence. 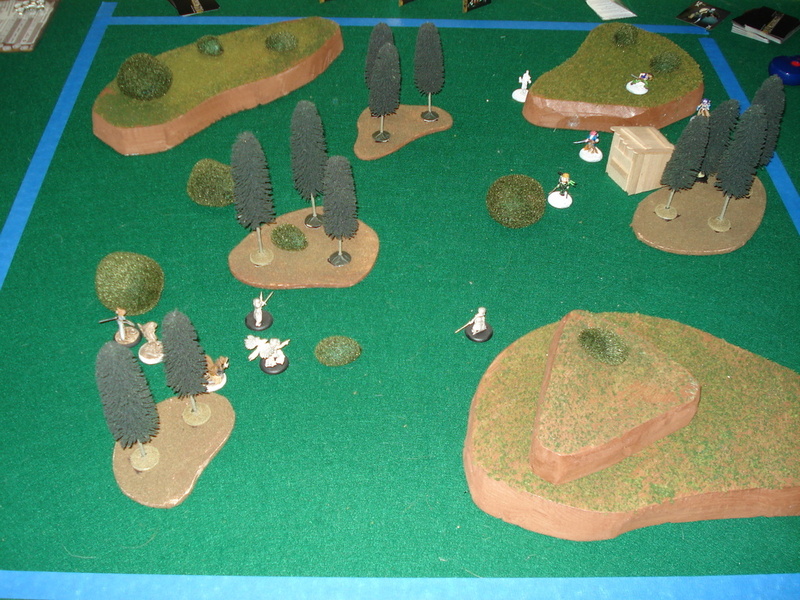 First turn, shortly after deployment. The first turn wasn’t too exciting, with everyone just moving up to get into position. 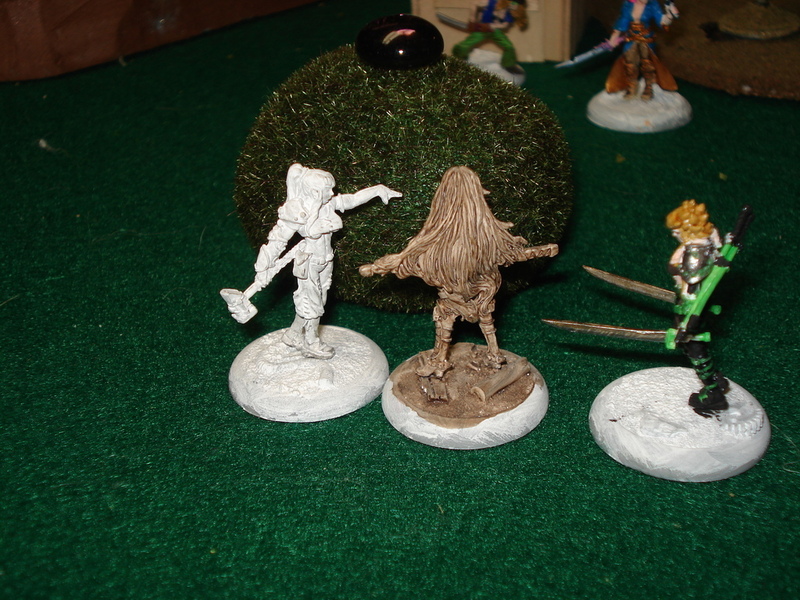 I won the initiative on the second turn and rushed Lady J up to plant evidence on the center bush. She then felt the full force of the Viktorias and was taken down to 1 wound by them and Taelor. On turn 3, I won the initiative again, and Lady J went on a spree, taking out the Sword Viktoria. 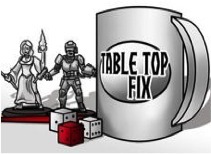 The Judge came in to help, but nothing could save Lady J.
I was able to get a Guild Guard over onto her half of the board to start planting more evidence, while my Death Marshal took out one of the Ronin on my side of the board. 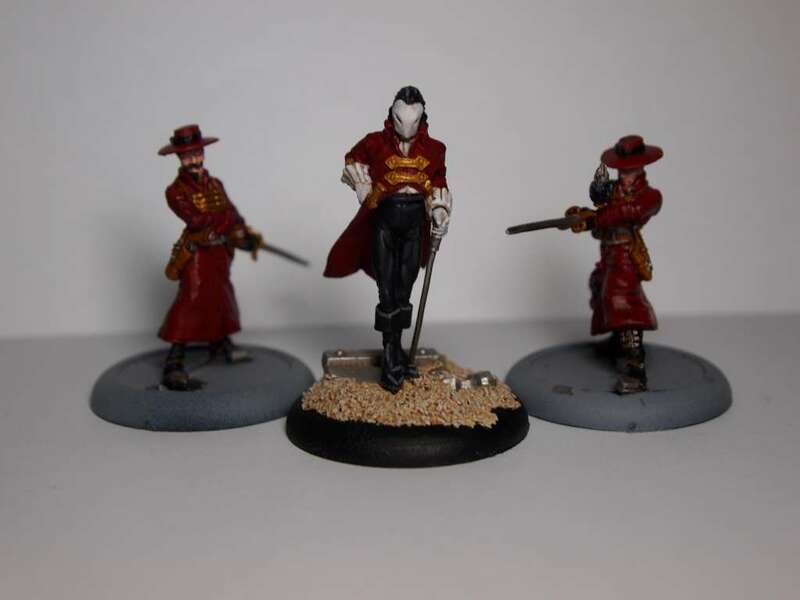 The other Ronin, and the gun Viktoria were able to plant two pieces on my half, but in the end I was able to get one more with my Guard to seal the victory 3-2 in favor of the Guild. Overall it was a fun game, though we were both a bit rusty. 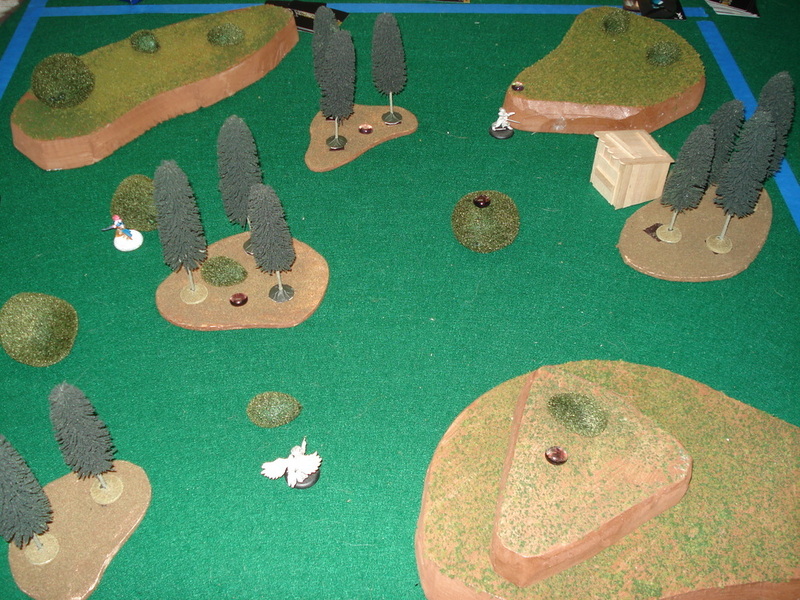 The additional terrain helped both sides get into combat a bit more easily though I did forget that the Austringer ignores terrain with his Raptor. 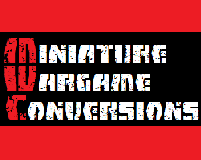 I’m still trying to wrap my head around the interactions and combos of Malifaux, so there is a lot of the game that I haven’t taken advantage of yet.